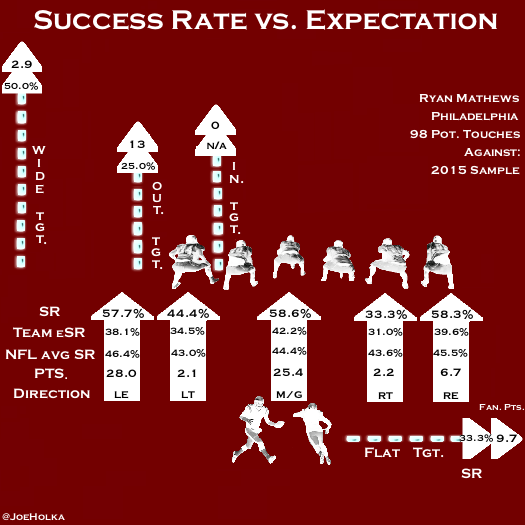 The expectations of Chip Kelly and the Philadelphia offense were supremely high last offseason, even with a running back situation seemingly in constant flux from the start. 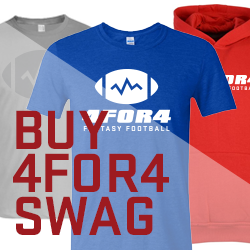 First the lead back was going to be LeSean McCoy, then Frank Gore, before it finally ended up being a committee with Ryan Mathews and DeMarco Murray when the dust ultimately settled. Many are quick to forget how excited we were about Mathews' fantasy prospects as reports loomed the former 12th overall pick planned to sign with the Eagles. Obviously, this was short-lived, as Kelly quickly scooped up Murray in free agency. The Eagles' running game ultimately took a step back in 2015. However, amidst a disastrous season that ultimately sent Kelly and Murray packing, Mathews had career year in regards to efficiency behind one of the worst run blocking offensive lines in football. As we transition to life after Kelly, the biggest concern under new head coach Doug Pederson (coincidentally the former assistant for the Chiefs with Andy Reid, Kelly’s Philadelphia predecessor) will be the reduction in play volume. The Eagles averaged the shortest time between plays in neutral situations under Kelly, while the Chiefs averaged the longest under Pederson. When Pederson was the offensive coordinator in Kansas City, the Chiefs ran an extremely running back-friendly system on a per-play basis in regards to both volume and efficiency, both on the ground and through the air. Pederson’s offense was in the top-10 in running back target percentage last season, and with three capable pass-catching backs on the Eagles roster, I have zero doubt that this will continue. With a talented defense that allowed Pederson to play slow and balanced, the Chiefs never ranked worse than 10th in rushing yards per game. The Eagles defense may not be as good as the 2015 Chiefs, but they are a unit on the rise under new coordinator Jim Schwartz, and they should at least be able to keep the team in games. Inevitably, 2016 could again be a year of inconsistencies at quarterback, whether it is Sam Bradford or rookie Carson Wentz. I don’t see this group of receivers lifting the offense up -- Philadelphia will trot out arguably one of the worst wide receiver cores in the league in 2016. Jordan Matthews, Rueben Randle, and Nelson Agholor will battle for targets along with tight end Zach Ertz. We have seen flashes from Ertz, but he has not been able to remain consistent thus far in his young career. He has never scored more than four touchdowns in a season and is not a dominant threat in traffic, converting just one-of-ten red zone targets into touchdowns in 2015. Speaking of the red zone, what may be just as troubling for Mathews as a reduction in play volume is the fact that Pederson doesn’t favor the run from 20 yards in as much as Kelly did. Per Chris Raybon, Pederson’s team ran 46.2% of the time in the red zone from 2013-2015, while Kelly ran it on 50.7% of the plays during that time span. As far as immediate threats in the backfield, veteran Darren Sproles and versatile rookie Wendell Smallwood could in theory cap Mathews' ceiling in the passing game. Mathews should, however, have a strangle hold on the goal line carries, and has very good finishing ability in short yardage situations. Although, I should note that Philadelphia beat writers are not ruling out another veteran entering the mix. That said, if Mathews can manage to be the clear-cut leader in volume with Murray’s 193 rushing attempts and 55 targets off the books, he should vastly outperform his current ADP. There are some players that run hard and don’t know how to play any other way, and Mathews is that type of back. He runs like the sidelines are lined with lava, often times refusing to go out of bounds and avoid contact. His competitiveness is admirable in battling for extra yardage on every play. Mathews’ one-on-one strength is good, and I graded his power above average. Mathews displays rare athletic ability and very good explosiveness, which complements his above average mental processing skills and good instincts. Mathews’ largest distribution of rushing attempts was charted through the middle at 35.4%, followed closely by runs to the left end at 31.7%. This was the largest percentage of total rush attempts to either end than any player in my initial 2015 sample (the next closest was Tevin Coleman [29.4%] to the right end). 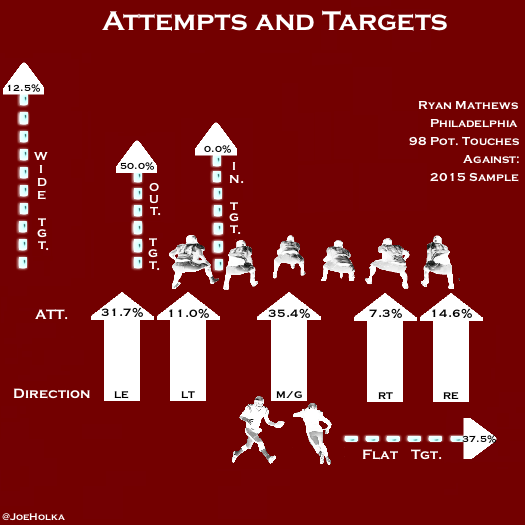 Mathews’ chart shows solid versatility in the passing game, though the sample size of 16 targets is small. He ran most of his routes to the outside lane, but did contribute out wide and in the flat as well. Mathews receiving skills were average -- he showed solid ball skills and hands when given the opportunity. In his NFL career, he has caught 78% of his passes on 212 targets. Mathews shows an immense amount of potential as a feature back from a talent perspective. From an efficiency or metrics perspective, the question is, did he exceed or fall below expectations in 2015, and does he deserve a larger role going forward? The overall eSR for Mathews and the Eagles was 37.5% per rushing attempt, the third-lowest in the league, and well below the NFL average of 44.3%. Philadelphia was equally unimpressive in pass protection, boasting the fourth-worst overall expectation of any team at 40.4% eSR per target for running backs. The good news is the run blocking should vastly improve in 2016 with the addition of right guard Brandon Brooks. Mathews was most successful running through the middle (58.6% SR), but was nearly as impressive on left and right end at 57.7% and 58.3%, respectively. Though his long speed is solid, Mathews has rare acceleration and is agile enough to bounce outside and use it to his advantage. Of the five players in the initial 20-player sample with 15% or more of their runs going to around end, only Ameer Abdullah (RE, 69.2%) and Carlos Hyde (LE, 63.6%) had a higher SR than Mathews did. It’s quite clear that even behind horrendous run blocking, Mathews’ efficiency numbers were immaculate. Let’s check out his overall Rushing Expectation results to see if there is something beneath the surface that can help explain this. Behind what was statistically a bottom-three run blocking offensive line, Mathews performed above expectation in his 2015 sample by 18.6% in the run game, but was one of the worst in pass game efficiency at -7.1% below his eSR. Mathews’ rushing efficiency put him number-one overall in my entire 20-player sample in regards to percent above expectation on rush attempts. Before Contact Yards are something I discuss at length in my introduction to Rushing Expectation. Elusiveness behind the line of scrimmage is an extremely underrated -- but prevalent -- ability among the league's best feature backs. Mathews’ before contact yards (rushing) of 6.7 yards per carry were fourth best of my initial sample. I should clarify that I chart yards before contact as the moment a player is handed the ball. I think what a player does as he approaches the line is just as important as what he does when he meets the line of scrimmage. Mathews' patience is noticeable, and he makes an effort to run with his head up. He is very good at evaluating when a crease will open and hits them decisively with his rare burst. 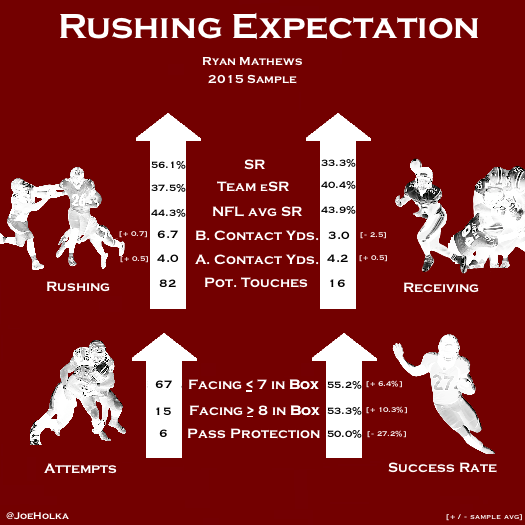 After first contact, Mathews’ averaged an above average 4.0 yards per attempt. He shows rare balance through contact from different angles, as he isn’t a true space player in regards to elusiveness and making people miss. He uses the stiff arm well through contact in the second level and is a threat to break big plays using his rare creativity and one-cut expertise. He is a threat to score from distance and in close, although he has never been an elite touchdown scorer. One concern from Mathews’ impressive efficiency in 2015 was he spent a lot of time facing defenses with seven our fewer in the box. Of my entire sample he faced the forth-most soft fronts of any player. With the lack of weapons the Eagles have in the passing game, it is very possible he could face a much higher percentage of loaded boxes in 2016. The positive side of this is, though a small sample size, the drop-off in his SR from seven or fewer to eight or more in the box was only (-1.9%). Another concern was Mathews’ lack of involvement -- and success -- in pass protection. With just six attempts in the seven games I sampled, it is hard to hold his 50.0% SR against him, but he didn’t read pressure or blitzes well. He needs to show at least adequate ability in pass protection to be trusted in third down situations. In addition to the on-field shift in coaching philosophy, beat writers anticipate that Philadelphia will be a committee situation and the team isn’t ruling out signing a veteran back. Even if that happens, a back off the street isn’t a significant threat to Mathews. The unknown dispersal of targets in the passing game is what’s more concerning. Sproles will likely maintain a prominent role, and if the Eagles are a bad team, perhaps the 33-year-old veteran is even more of a threat than we realize. Wendell Smallwood has enjoyed some rookie hype this offseason, but he will have to learn to pass protect to get on the field consistently. If he were drafted to replace Mathews, the Eagles probably wouldn’t have waited until the fifth round. I am not buying into the narratives that see him with significant action this year. Mathews has been placed on the Eagles Active/Non-Football Injury list after hurting his ankle in a workout last week. He was seen walking without a noticeable limp and the injury is not believed to be severe. He is still recovering from groin surgery after the season but he is not expected to miss any time in training camp, although Philadelphia has not alluded to a timetable for his return. Injury concerns will seemingly always loom over Mathews (he’s played a full season just once in his six-year NFL career), but the upside and excitement surrounding him as a potential elite fantasy option when healthy is not at all outlandish. If anything, Mathews is still highly undervalued.